While I am blogging this recipe, I am also listening to some very soulful, soothing, upbeat music. You may say so what. But l am listening to Alexandre Desplat, Joshua Radin, Isbells -Elation on Lekha Shastry’s new blog i-heart-beat. She puts a selection of songs together to brighten your day. A while ago I was feeling really low, have had a bad day and decided to blog to take my mind away from all the worldy woos. Then I remembered that Lekha was eagerly waiting for some comment about her blog. I heard Elation by Isbells and felt uplifted instantly. I didn’t realise that the music score from the movie King’s Speech was so soothing and beautiful. I normally listen to bollywood music old and new and realised that I was missing out on some of the beautiful music created in the western world. So Lekha thanks for re – introducing me to that world. Music is still playing as I write. So please visit her blog. Am sure she has something that you may love. Lekha is my daughter Nami’s best friend, soul mate and like a daughter to me. Coming to the recipe, I made an absolutely delicious salad a few days ago. Very refreshing, sweet and satisfying. Very simple to put together. Go on try it out. Its just like the exotic salads we eat at the fancy restaurants but not paying a lot for it. Cheap and fresh right from your kitchen. Wash and dry the salad and spinach leaves. Hull and cut the strawberries into half. Peel the avocado and cut it into thick slices or chunks. Put the avocado, strawberries, salad leaves,onion and coriander or mint in a bowl and gently toss it. To prepare the dressing, mix all the ingredients and pour it over the salad. 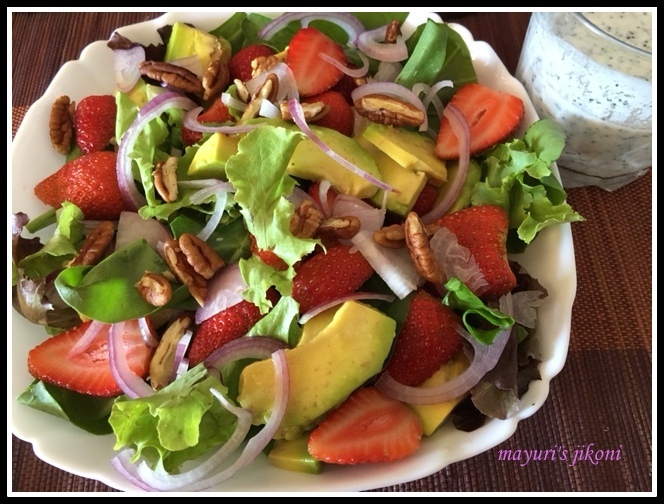 A good salad to carry for lunch or picnics. Just don’t the dressing. Carry it in a separate container. However, make sure you pour some lemon juice over the cut avocado. If you don’t get any black poppy seeds, add the white ones or black sesame seeds. I put some yogurt in a muslin cloth and left it for 10 minutes to let the extra water drain out. Healthy salad, looks so inviting. Hello Aunty! Thanks for the appreciation of my blog, you made my MOnday. And I will put up one old hindi song post for you soon. You're such a cutie– but remember I am your favourite daughter! !